equipped with the TireVigil Cloud solution. solution, and the projected savings attainable by deploying TireVigil throughout the entire fleet. The results are calculated every day using TireVigil Cloud's algorithms and analytics based on each fleet's actual tire data. It uses industry accepted calculations made available through the North American Council for Freight Efficiency (NACFE) 2013 Report on tire pressure monitoring systems. Additional information that this dashboard provides at a glance includes the different areas where savings are being achieved and is broken down in labor, breakdowns, fuel consumption, tread wear and Operations. A bar chart depicts the number of prevented breakdowns on TireVigil monitored vehicles and the number that could be prevented on vehicles that have yet to be deployed. A gauge indicates if the number of breakdowns is acceptable or needs improvement. A Current Vehicle Alert Listing displays vehicles with tire alerts listed in order of service priority based on the time remaining before a tire reaches a critical level that jeopardizes its health. This is knowledge that has never been available to fleets before. A map shows where these vehicles are and their current alert status. "Never before have fleets been able to see the financial impact their tire maintenance has on their bottom line using their own, real data in such a simple and clear way. The Savings Dashboard is a tool that Operations, Maintenance, and Upper Management can use to prevent disruptions in Operations, improve tire maintenance and positively impact the bottom line", said Peggy Fisher, TireStamp President. 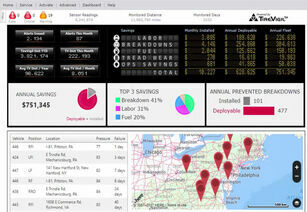 A video ‍‍‍is available on TireStamp's website that shows the Savings Dashboard in action. Maintenance, ‍‍‍and Upper Management with a tool to impact the bottom line.